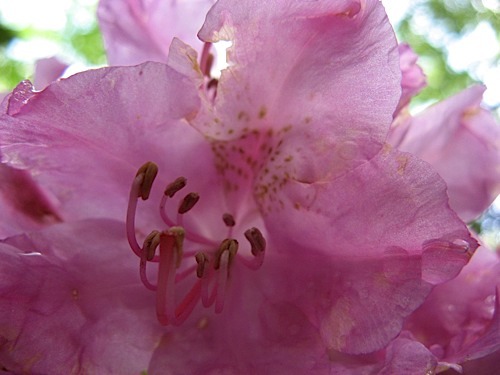 I had it on good authority that the rhododendrons were blooming like crazy at Hanging Rock State Park. That was last Monday. Well, as of May 15, the Big Bloom was still on, but like so many hikers it’s moving up the hill. 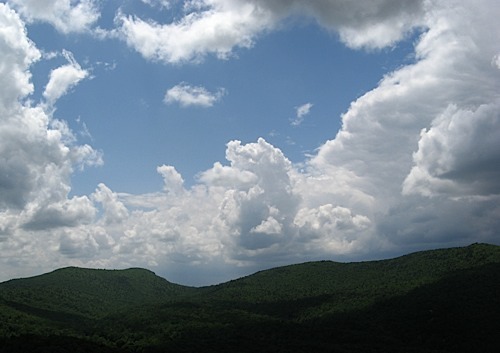 I hiked just over 8 miles, climbing to Moore’s Knob from near the bathhouse, descending along the loop trail and hanging a right to slog it back up the parallel ridge near Wolf Rock. From there I took a side trip to Hanging Rock and looped back to the car. 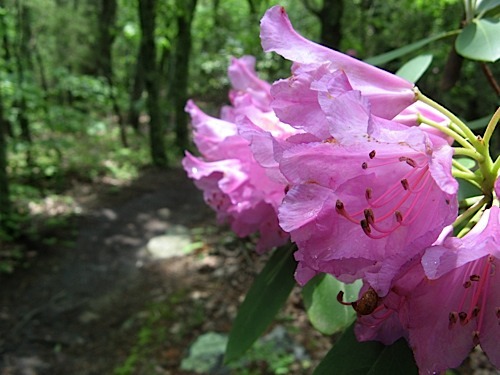 There’s probably over 2,000 feet of elevation gain on this loop, so it’s borderline strenuous, but if you’ve got the legs for it, it’s really the best hike at Hanging Rock–especially when the May wildflowers are blooming. 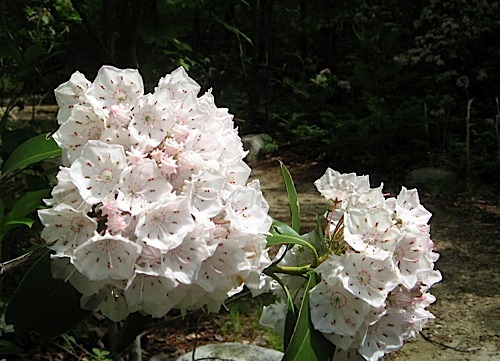 Speaking of which, the mountain laurels are also going great guns, some blooming right along the road into the park. 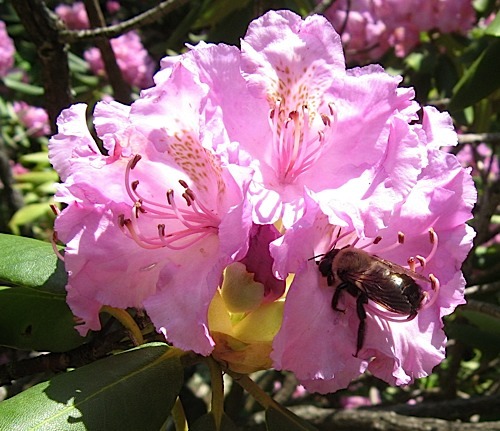 When I parked my car near the park lake, though, the first thing I saw was the tell-tale spoke pattern of a rhodo that had shed its petals. Could the be all gone in six days? Couldn’t help wondering, seeing as how I have an uncanny knack for showing up when all the fun’s over (like moving to Silicon Valley in late ’99). 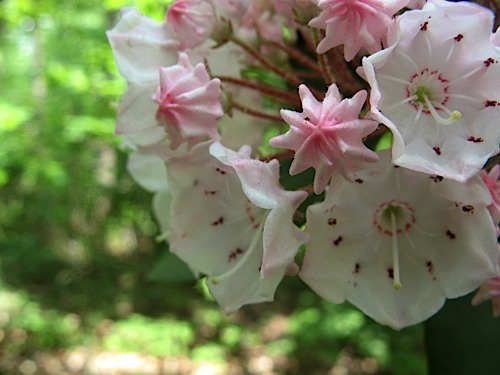 Actually the rhodo plant is pretty interesting even minus the blooms. 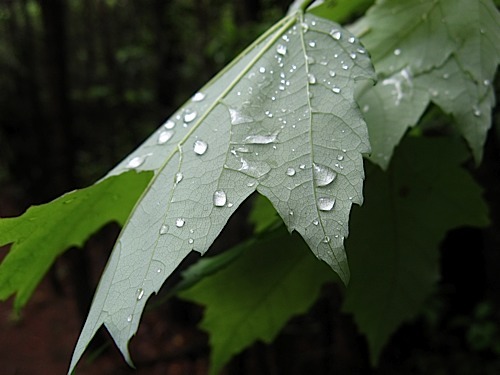 Taking no chances on coming home w/no pictures of things growing in nature, I snapped off one of my favorite droplets-on-leaves shots. I needn’t have worried. It was just a matter of hiking up to the elevations where they’re still blooming — for rhodos the bloom line was about 1,900 feet. 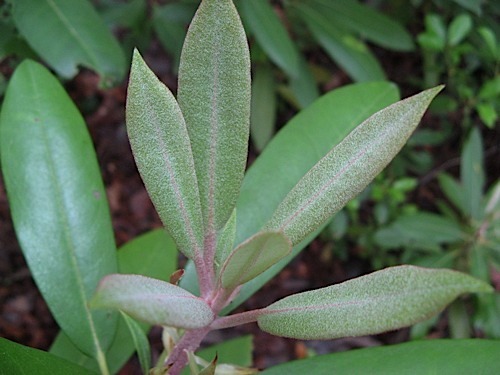 Mountain laurels were all over the place, pretty much at all elevations. 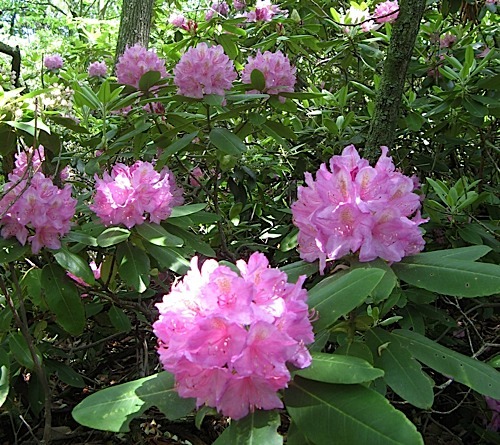 It’s actually difficult to convey what an individual rhodo looks like because they bloom in these big fat clumps. 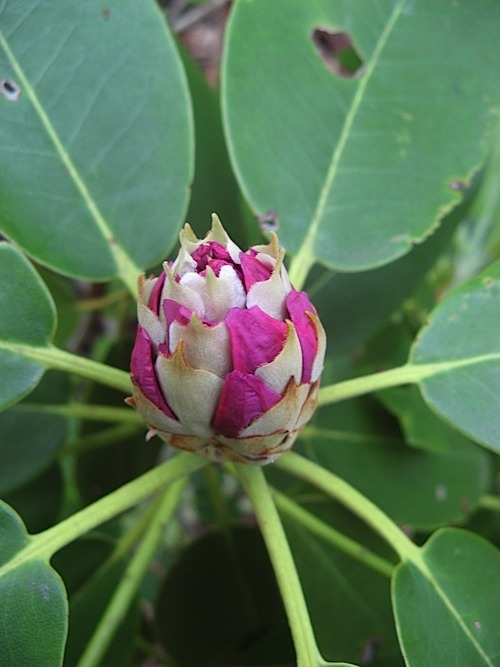 My favorite shot of the day — near the top of Moore’s Knob (around 2,400 feet here) I saw a bud about to bloom. Looked like some kind of lunatic artichoke. Had great sky for once atop Moore’s Knob. A few more rhodos blooming on the way back down. They vanished below 1,900 feet. I tried several times to capture the mountain laurel buds — they’re just as charming as the actual flower (maybe even more so). One more big clump of rhodos on the Cook’s Wall Trail. Did catch this very large bee going about its business (anybody know what kinda bee it is? ) Might just be a yellow jacket. Big, whatever he was. More cool sky above Hanging Rock — timed this just right: the rain started just about when I started the car to leave. OK, that’s enough for this week. Note if you take this hike: pay attention to the weather: I saw a bunch of people heading up toward Hanging Rock who could not have missed the fact that a minor rainstorm was blowing in. I’m sure they all got drenched; fortunately no lightning or tornadoes, this time. Get your fanny back down before the storm hits. Superb photos. What camera are you using? Nothin’ fancy: Much-abused Canon A710-IS. The trick is knowing what to look for, knowing for certain that 99 percent of what you shoot will be crap and shooting LOTS of frames, then selecting and cropping. I should actually do a blog post on this. Stunning photos; looks like I’m going to have to head down to Hanging Rock soon! 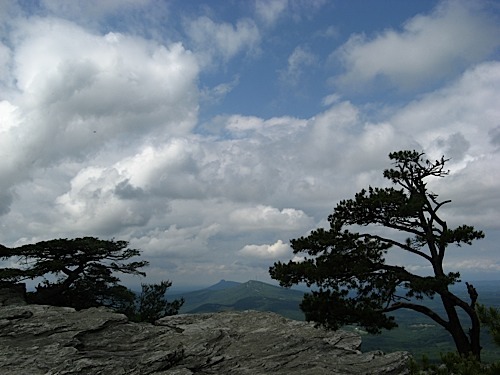 Well the flowers are all gone from Hanging Rock by now I suspect — though I may have to check out Max Patch since you recommended it so highly. Yes, you would love Max Patch, Tom! We hiked from the patch to Brown Gap, but next time I think we’re going to hike from Max Patch to Lemon Gap. This route keeps you on the sweeping meadows longer. I did Max Patch to Roaring Gap yesterday. Writing it up now. Tawnee: it was VERY big bee; maybe not as big as it appears in the photo, but notably fat and healthy. I really enjoyed your post. 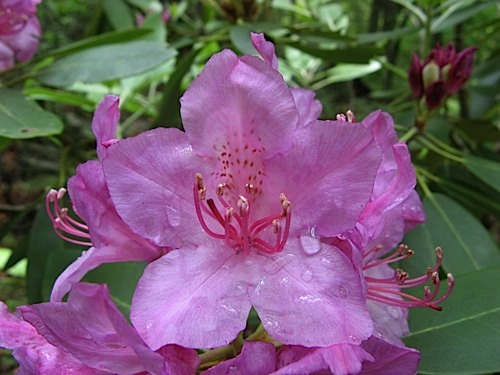 It’s been a long time since I’ve had a chance to see the rhododendrons blooming at Hanging Rock. So I have changed my comment software to Disqus, which is becoming all the rage these days. Let’s see how it looks.